In honor of the Buy One, Get One Free sale happening now at econutssoap.com (through 1/25/15), I want to promote them and give my tips for use. 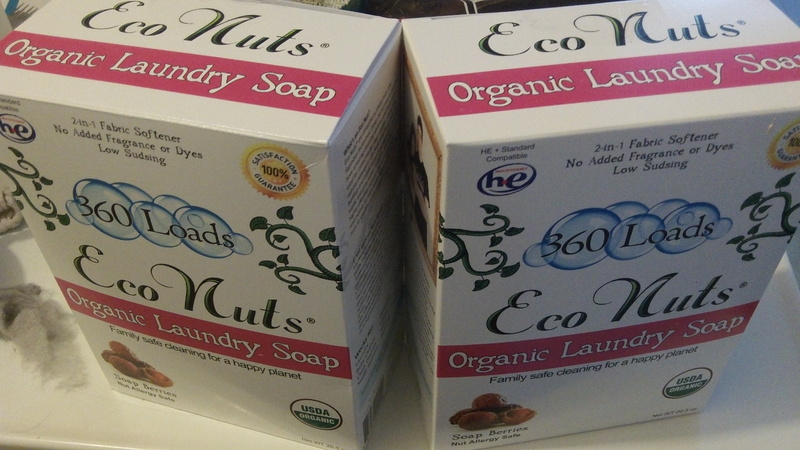 Eco Nuts soap nuts are, in a “nutshell”, organic laundry soap. Technically, the “nuts” are berries, so they are nut allergy safe. The soap, called saponin, is naturally produced in the berries. Something my husband has had a hard time wrapping his head around is this: Bubbles and foam do not make clothes clean. Commercial laundry soaps have artificial foaming agents. These soap nuts do not produce foam or bubbles. I am here to tell you, the clothes still get clean!! I use the bag about 7 or 8 times before checking the status of the soap nuts. When they look broken apart and just…dry, I will throw them away (you can also compost them) and replace them with a new 4-5 soap nuts (in my case, 5) in the bag. If they don’t look quite broken up yet, I’ll just add 5 new ones to the bag and have 5 new and 5 old inside. HERE is a chart and video on the Eco Nuts website to help you know when the are used up. In the corner of the dry erase board I add up how many uses I got because I’m curious! The box I’m using is for 360 loads. However, I rarely use all ten because you can use it “up to” 10 times and I, wanting the ultimate clean, replace before 10 loads all the time. Plus, I always use 5 nuts instead of the also acceptable 4. I’m not worried if I don’t make it to 360 loads. What i love about soap nuts is the cost-effectiveness. Check out this chart (link) for the price per load of Eco Nuts Soap Nuts compared to other brands. Not to mention, the various other selling points – Eco Nuts Soap Nuts are fragrance free, SLS free, no dyes or optical brighteners, and have a natural fabric softener. That chart also says that the 360 load box is 9 cents per load. Until 1/25/15 you can buy 2 boxes for the price of one, and that would be 4.5 cents per load! Pretty impressive, considering the free and gentle I used to buy is 29 cents per load according to the chart. 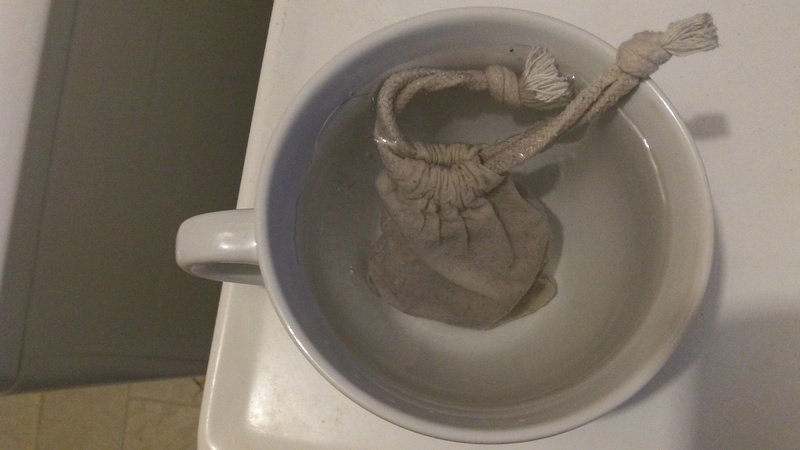 For my cold laundry, which is at least 4 loads a week, I make a soap “tea” by putting the bag into a mug filled with hot water and letting it soak for the amount of time it takes to add clothes and fill the drum up with water. Then i pour the whole thing – “tea” plus soap nut bag – into the washer. This is recommended for hand wash and heavy soil, but because I want my clothes to get the cleanest clean and the soap nuts are better activated in hot water, I go ahead and make the tea every time I use not-hot water to wash anything. Since I have been using the Eco Nuts soap nuts, my clothes smell clean but not like an artificial fragrance, and they look clean, too. I have seen some bad stains remain and my next adventure will be trying oxygen bleach sold on their site as well. I highly recommend Eco Nuts Soap Nuts if you have sensitive skin – like me, or if you want to save money (who doesn’t? ), or if you want to be more eco conscious (I do!). Would you switch to an organic laundry soap? This entry was posted in Cleaning, Product Review and tagged cheap, clean, cleaning, inexpensive, laundry, laundry soap, organic. Bookmark the permalink. Awesome article. I have never ever heard of this product, but I am always interested in a more ecofriendly way of life. Especially in my area where septic tank run off and laundry detergents are a big issue! Thanks! That’s really interesting – I didn’t think about septic tank run off!